Home » Heart Health » Running or Walking: What’s the Health Difference? Running or Walking: What’s the Health Difference? Do you know someone who is a runner? Perhaps it’s you who hits the pavement in the early hours of the morning to get some jogging in. Runners will tell you that this is the best form of exercise. You’re not just getting all the regular benefits of exercising like improved circulation, muscle strength and aerobic fitness. You’re taking things to the next level. By upping the intensity of your exercise, you’re virtually doubling the health benefits you’ll reap from your efforts—or so the thinking goes. However, a new study, conducted at the famed Lawrence Berkeley National Laboratory in California, has discovered this may not necessarily be the case. The Berkeley research team looked at both running and walking and compared their respective health benefits. To collect their data for this huge trial that spanned six years, the researchers turned to two major clinical trials: The National Runners’ and Walkers’ Health Studies. Both these studies looked at the intensity the participants invested in their preferred form of exercise and then determined what effect this physical activity had on incidences of some common diseases. Now—if you don’t like running, go ahead and breathe a sigh of relief, because these numbers show that running and walking have comparable health benefits. This is the good news you’ve been waiting for. For those of you who can’t jog due to other health issues, all you have to do is get out and do some walking to help lower your risk for some of these major health complications that are affecting the lives of so many people. The one advantage of walking over running is that it’s easy enough to get a friend on board for a little company. 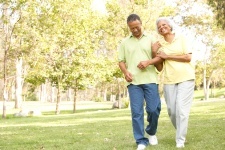 Walk together and share some conversation while you get some exercise. Take your dog for a walk. Go play a game of golf and walk nine or 18 holes on the course. Walk to the grocery store and pick up some healthy food for the week. Walking is easy to fit into your daily routine—all you have to do is set aside a little time for it. Williams, P.T., et al, “Walking Versus Running for Hypertension, Cholesterol, and Diabetes Mellitus Risk Reduction,” Arterioscler Thromb Vasc Biol April 4, 2013.